The railways sector is one of the high-growth areas in India, so far as infrastructure is concerned. Much of it still runs on a setup that its former colonial ruler, the British Empire, left behind, and then some. In a bid for modernization, which includes a bullet train, India wants steel for new and replacement rail tracks, wagon wheels and so on. There are billions of dollars worth of contracts to be given out, but there’s a problem. There are barely two domestic companies who can provide what the Indian Railways (IR) wants. 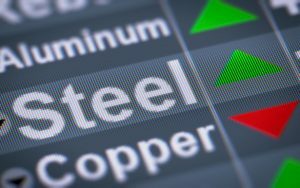 This morning in metals news, Chinese steel prices are up ahead of the peak construction season, mining companies around the world are looking to change the way they operate in the wake of Vale SA’s fatal dam collapse and solar sector companies are sourcing prefab in order to find a way around the Trump administration’s steel tariffs. Ahead of the peak construction season, Chinese steel prices have gone up, while iron ore traded flat, Reuters reported. On Wednesday, the most active rebar contract on the SHFE ticked up 0.2% to 3,715 yuan per ton ($555.54 per ton), according to the report. 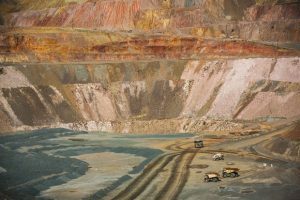 The fatal tailings dam collapse Jan. 25 at Vale SA’s Corrego do Feijao mine in Brazil has other miners thinking about what they can do to prevent such a disaster from occurring at their own operations. According to a Reuters report, a group of 27 CEOs — including those of Freeport-McMoRan, Vale, BHP Group and Glencore — agreed this week to form a panel that will “set international design and maintenance standards” for dams. Solar makers are using an end around to the Trump administration’s steel tariffs, Bloomberg reported. How are they doing this? By sourcing prefab products from overseas, as the article cites the case of one solar company sourcing steel racks from India. Global crude steel production growth slowed in January, hitting its lowest level since August. 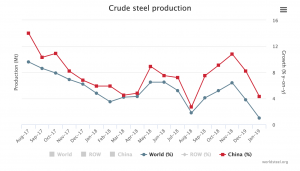 According to the World Steel Association, global crude steel production rose 1.0% year over year in January, down from 3.8% growth in December. Global steel production in January hit 146.7 million tons (MT). 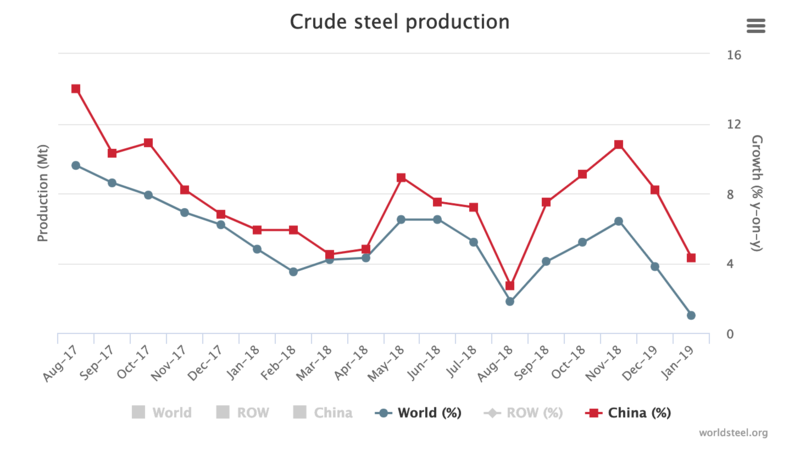 As usual, China led the way in crude steel production, churning out 75.0 MT, marking a year-over-year increase of 4.3%. India, which recently passed Japan as the world’s second-largest steel producer, produced 9.2 MT, which was down 1.9% year over year. The country India passed in the steel production standings, Japan, saw its production fall 9.8% to 8.1 MT, while South Korea’s production fell 1.5% to 6.2 MT. The U.S. produced 7.6 MT in January 2019, marking an 11.0% year-over-year increase. U.S. steel mills continue to fill an incrementally larger share of total capacity. According to the American Iron and Steel Institute, U.S. steel mills churned out steel at a capacity utilization rate of 80.9% through Feb. 23 of this year, up from 75.7% for the same period in 2018. By tonnage, U.S. steel mills produced 14.6 million net tons in the year through Feb. 23, which marked an 8.0% increase over the same period in 2018. In Europe, Italy’s crude steel production fell 3.6% to 2.0 MT, which France’s dropped 9.7% to 1.2 MT. Spain also produced 1.2 MT, marking an increase of 5.9%. Crude steel production in Ukraine hit 1.9 MT, down 4.9%, while Brazil’s crude steel production rose 2.3% to 2.9 MT. Turkey’s steel sector continues to face challenges, with 2.6 MT in January marking a 19.5% year-over-year decline. Turkey’s steel remains subject to the U.S.’s Section 232 steel tariff, which the Trump administration increased to 50% from 25% last year amid diplomatic tensions. In addition, another Turkish export market, the E.U., recently imposed new steel safeguards in an effort to curb diverted steel supplies (which it sees as an outcome of the U.S.’s Section 232 action). This morning in metals, the U.S.’s steel capacity utilization rate inches upward, Emirates Steel forecasts a slower 2019 for regional construction and copper falls back from its eight-month peak. According to the American Iron and Steel Institute’s weekly steel production report, U.S. steel mills churned out steel at a capacity utilization rate of 80.9% through Feb. 23. Production for the year to that point hit 14.6 million net tons, up 8% year over year. This year will be a slow one for regional construction, according to the biggest steelmaker in the United Arab Emirates. According to Reuters, steelmaker Emirates Steel said construction in the region is expected to slow this year, impacted in part by oil price dynamics and weaker global growth. The copper price has been trending upward of late, recently hitting its highest level since last July. However, the LME copper price slipped on Tuesday, according to Reuters. Three-month LME copper fell 0.2% Tuesday, according to the report. This morning in metals news, the copper price has surged to its highest level in 7 1/2 months, Canada’s ambassador to the U.S. is confident the U.S.’s Section 232 steel and aluminum tariffs will be coming to an end soon and China’s state-backed Chinalco plans to sell an aluminum plant for just under $164 million. The copper price, after a sluggish close to 2018, has surged to a 7 1/2-month high, Reuters reported. Copper jumped 1.2% Friday, up to $6,454 per ton — its highest level since July 4, according to the report. It has been a year since the Trump administration went forward with Section 232 tariffs on imported steel and aluminum. Furthermore, it’s been nearly nine months since the tariffs went into effect for NAFTA ally Canada. Canada, along with Mexico and the E.U., initially won temporary exemptions to the tariffs; however, the exemptions expired as of June 1, 2018. According to David MacNaughton, Canada’s ambassador to the U.S., he expects the tariffs to be removed in the next few weeks, Global News reported. China’s state-backed Chinalco is looking to sell its Guangzhou processing plant for $163.7 million ($1.1 billion yuan), Reuters reported. 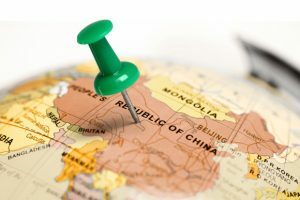 According to the report, Chinalco said the plant made a loss of 15.41 million yuan in 2018. Are CME HRC Futures Ready for Prime Time? The Chicago Mercantile Exchange (CME) hot-rolled coil (HRC) steel futures market finally demonstrated increased liquidity during 2018, about five years following its introduction in February 2014. Both volume of trading and open interest numbers showed improvement during 2018, as evidenced by increasing trade volumes throughout the year. Additionally, the London Metal Exchange (LME) introduced a new Hot Roil Coil contract. As a result, there’s been quite a bit of excitement and coverage lately of the HRC futures market — is it warranted? Looking at Chart 1, since January 2018 or so, the CME HRC finally experienced an uptick in regular daily trading volumes, as demonstrated by the bars along the bottom of this daily settlement price chart. Chart 1: Trade volumes are increasing, finally hitting a regular stride during 2018. The next chart also shows a positive sign for CME HRC futures. Open interest shown by the red line in the chart continues to trend upward, charted along with the daily settle price. Chart 2: Open interest in CME HRC futures continues to increase. 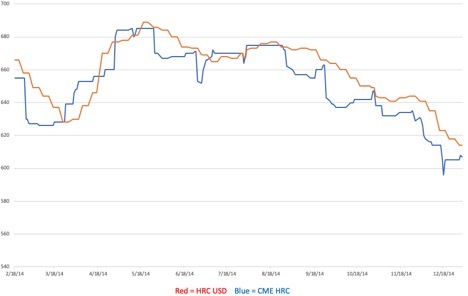 Have HRC Prices Moved Similarly to Other Steel Price Indexes? Taking a full look back at prices of CME HRC against our own MetalMiner IndX(™) price tracking since the inception of the trading product, we see only small amounts of variability between historical MetalMiner IndX(™) HRC prices and CME HRC prices. Chart 3: The MetalMiner IndX(™) U.S. HRC price versus the CME HRC close of day price, February 2014 to February 2019. Taking a closer look, the next chart focuses on the year 2014 from the CME HRC’s inception date. As shown in the first couple of charts, the U.S. HRC price was fairly stable around 2014. 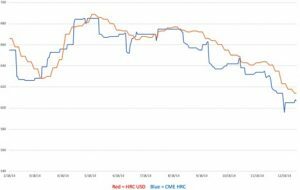 Comparatively speaking, the CME HRC price was less stable (although it may have offered a speculative opportunity, as it tended to fall faster than actual prices). Chart 4: The MetalMiner IndX(™) U.S. HRC price versus the CME HRC close of day price, 2014. Generally speaking, volatility increased in 2015, as the price dropped into December 2015. Thereafter, the price became more prone to fluctuations, but still traded mostly sideways in a band around the earlier price highs from 2013 and never returned to quite as low a price as it hit in 2015. In early 2018, the price of HRC increased. Actual prices tracked by MetalMiner’s IndX(™) seemed less volatile than CME HRC prices. However, prices trended very similarly. 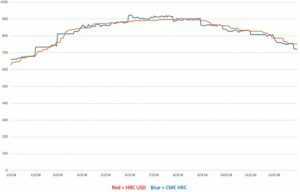 Chart 5: MetalMiner’s U.S. HRC price versus the CME HRC close of day price, 2018. 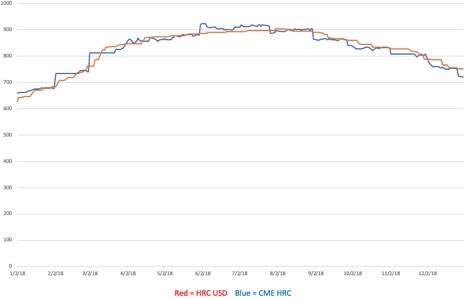 The CME HRC futures liquidity amped up during 2018, the product’s fifth year on the market. Volume and open interest increased. CME steel prices tended to follow a fairly stable trajectory, similar to what the major indexes report (e.g. CRU, TSI, Platts, etc). Furthermore, large organizations with significant planning needs that buy in sizable volumes may benefit from the arbitrage play these contracts allow, as well as the overall benefits of using hedging instruments to lock in margins. Do you want to improve your internal data tracking capabilities? Request a free two-month trial for our metal prices data service. This morning in metals news, Chinese steel and iron ore prices dropped, miner BHP’s first-half earnings fell 8% and the ongoing shutdown of Vedanta’s Sterlite Copper plant has boosted copper prices led to increased dependence on imports for Indian consumers. Steel and iron ore prices in China fell Wednesday on the heels of the Lunar New Year, Reuters reported. SHFE rebar prices, for example, fell 2.3% to 3,590 yuan ($533.81) per ton. Miner BHP Group’s first-half earnings were down 8%, CNBC reported. According to the report, the miner cited declining production at its Escondida copper mine in Chile and other production outages elsewhere. The Indian Supreme Court recently reversed a previous ruling by a lower court that would have allowed Vedanta’s Sterlite Copper plant to reopen in the southern Indian state of Tamil Nadu. As noted by Bloomberg, the price of London copper rose 1.1% Monday on the news of the high court’s reversal. As a result, Indian consumers have had to depend on imports, Bloomberg notes, as the Sterlite plant, which boasts an annual capacity of 400,000 tons, remains shuttered. The plant was shuttered last year after locals protesting pollution from the Tuticorin plant were fired upon by police, resulting in 13 deaths. 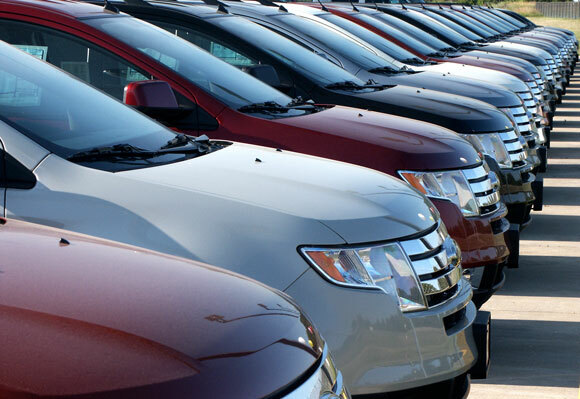 This morning in metals news, the U.S.’s Section 232 automotive investigation moves forward, Tokyo Steel announces its prices will remain steady next month and the copper price got a boost from an Indian Supreme Court ruling. On May 23, 2018, the Trump administration initiated a Section 232 investigation to determine whether imports of automobiles and automotive parts are negatively impacting national security. Pursuant to Section 232 of the Trade Expansion Act of 1962, Commerce Secretary Wilbur Ross then had 270 days to send the president a report with recommendations vis-a-vis the probe. According to Reuters, Ross sent his report to the president Sunday, two hours before the close of the deadline. For the third month in a row, Tokyo Steel has opted to keep its prices steady, Reuters reported, citing a weaker overseas market and slower winter construction demand. Per the report, rebar will remain at 69,000 yen ($624) per ton. According to another Reuters report, the copper price got a boost after the Indian Supreme Court reversed an environmental court’s prior ruling that would have allowed a Vedanta copper smelter to reopen. The smelter was closed last May after a protest over pollution from Vedanta’s Sterlite copper plant turned deadly; authorities fired on the protestors, resulting in 13 deaths. Two major dam disasters in three years are enough to put the frighteners on investors and get the media abuzz with talk of supply-side shortages. Yet as small as Vale’s production loss is, the fact remains the market is relatively tight, and supply is becoming an issue again after many years of plenty. According to Reuters, the Corrego do Feijao mine shutdown will result in only a 1.5% production loss to Vale, hardly enough in itself to create a surge in the iron ore price to a four-and-a-half-year high of over $100 per ton last week. The fear appears to be more about what comes next. Steel imports are once again threatening India’s steel sector, spurring major steel companies to ask the government to impose steel import duties. In the past few months, representatives of steel companies like Tata Steel and JSW Steel have met steel ministry officers with a request that the Indian government look at the present steel import-export scenario and impose duties. According to a Reuters report, Indian domestic producers are facing not only the issue of cheap imports from China, Japan and some Southeast Asian countries, they are also been buffeted by low domestic prices. Now, there are reports coming in that the steel companies are seriously contemplating increasing prices, which seems like a contrarian position since consumers have the option of buying cheap, imported steel. At the start of the present financial year, India had turned into a net steel importer for the first time in two years. By June, imports had increased by as much as 15%. JSW Steel has already hiked the prices by over $100 per ton; others are thinking of following suit. The reason? An increase in some raw material prices and growth in international steel prices. Indian companies have explained their proposed hike was to be in sync with rising international prices. Imports, however, are what are causing Indian steel majors a major headache. Imports of stainless steel from Indonesia, for example, has grown by nine times, according to the Indian Stainless-Steel Development Association (ISSDA). ISSDA also feels that countries like Indonesia, Malaysia and others are allegedly abusing the Association of Southeast Asian Nations (ASEAN) free trade agreement. The steel ministry is sympathetic to the demands of local producers, and may be contemplating some measures to curb the situation. But it’s not clear exactly what the government plans to do. Some reports said the new measures may be more in the nature of non-tariff measures. It’s a case of once bitten, twice shy for India on this matter. In 2016, it lost a dispute against Japan at the World Trade Organization (WTO) on charges that New Delhi unfairly imposed import duties to safeguard its steel industry. JSW Steel’s Joint Managing Director Seshagiri Rao was quoted last month as saying there was an urgent need to raise duties on steel imports, dubbing them a “major threat” to domestic industry. In the first nine months, while exports from India fell by 38%, imports grew faster, Rao pointed out.